Rheinmetall AG is a European defence contractor. Rheinmetall has a presence in two corporate sectors (automotive and defence) with six divisions, and is headquartered in Düsseldorf, Germany. In fiscal 2018, the company generated sales of €6.148 billion. The Group's Automotive segment had sales in fiscal 2018 of €2.930 billion, while sales of its Defence segment for the same period came to €3.221 billion. Rheinmetall AG is listed on the German MDAX; its shares are traded on all German stock exchanges. 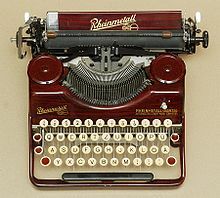 After World War I Rheinmetall produced non-military items including office equipment. As Rheinische Metallwaren- und Maschinenfabrik AG, the now Rheinmetall AG was founded in April 1889 in Düsseldorf by Heinrich Ehrhardt and his associates to take on a contract that Hörder Bergwerks- und Hüttenverein (a munitions company) could not fulfill. In 1901 Dreysesche Gewehrfabrik, Munitions- und Waffenfabrik was acquired. After World War I, as a result of the limitations imposed upon Germany in the Treaty of Versailles, Rheinmetall produced non-military items including locomotives, steam ploughs and office equipment. Military production recommenced in 1921, and in 1925, the Reich acquired a majority stake of the company. The railway locomotive manufacturer August Borsig GmbH was taken over in 1933; in 1936 the two merged to create Rheinmetall-Borsig AG. In 1938 the company headquarters moved from Düsseldorf to Berlin. In 1956 a majority stake in Rheinmetall-Borsig AG was acquired by the Röchling Group. Borsig AG was sold to Salzgitter AG and the company name changed to Rheinmetall-Borsig AG to Rheinmetall Berlin AG. Defence-related production would also start again in 1956, the first product being the MG 42. In 1958 diversification into the mechanical engineering and electronics fields occurred and during 1979-1981 these non-defence sectors were thoroughly restructured. Carburetor manufacturer Pierburg GmbH was taken over in 1986 and the current Automotive sector was created. In 1989 the takeover of MaK Systemgesellschaft, a manufacturer of armoured vehicles, occurred. In 1996 Rheinmetall Berlin AG changed its name to Rheinmetall AG. Rheinmetall AG's Defence arm produces equipment and systems for government, security and military ground, air and naval forces. The defence arm was initially reorganised in 2012 when the then six divisions were restructured into three new divisions, Combat Systems, Electronic Solutions and Wheeled Vehicles. The three divisions were each headed by a member of the Executive Board of Rheinmetall Defence. Originally this was Armin Papperger representing the Combat Systems division. Representing the Electronic Solutions division was Bodo Garbe, while Pietro Borgo, then Managing Director of RMMV GmbH, represented the Wheeled Vehicles division. A more recent minor restructure resulted in the Weapons and Ammunition, Electronic Solutions and Vehicle Systems divisions, these now represented on the management board by Dr Alexander Sagel (Weapons And Ammunition), Susanne Wiegand (Electronic Solutions,) and Ben Hudson (Vehicle Systems). Armin Papperger is now Chairman of the Management Board Defence at Rheinmetall AG and CEO of Rheinmetall AG. Though based in Germany, Rheinmetall Defence has a global presence. The Weapons and Ammunitions division has 13 subsidiaries, the Electronic Solutions division has 17 subsidiaries, and the Vehicle Systems division has five subsidiaries. Along with international subsidiaries - Rheinmetall Defence Australia Pty Ltd; Rheinmetall Defence UK Limited; Rheinmetall Eastern Markets GmbH and Rheinmetall Limited Liability Company, these 35 subsidiaries in the form of production plants and representative offices are spread throughout Germany and 21 other countries worldwide: Australia; Austria; Belgium; Canada; Italy; Malaysia; Mexico; Netherlands; New Zealand; Norway; Poland; Qatar; Russia; Saudi Arabia; South Africa; Singapore; Sweden; Switzerland; UAE; UK; USA. Rheinmetall has further shareholdings in ARTEC GmbH (Munich); PSM Projekt System & Management GmbH (Kassel), and Defense Munitions LLC (Wilmington USA). Rheinmetall Landsysteme GmbH was formed in 2000 when the hitherto independently operating companies Henschel Wehrtechnik, KUKA Wehrtechnik and MaK System Gesellschaft GmbH were merged to form it. In 2002 and as part of the process of focusing on defence, Rheinmetall sold the Eurometaal Holding N.V. subsidiary Intergas B.V., a furnace and boiler manufacturer. Eurometaal N.V. (Netherlands) was closed. In 2003 Rheinmetall acquired the remaining shares of Oerlikon Contraves AG to becoming sole owner. STN Atlas Elektronik was divided into two parts, the land, air systems and simulation departments remaining part of the then Rheinmetall DeTec, with the naval systems unit and the production department transferred to BAE Systems, former co-owner of the company. To complete the process of shedding non-core businesses, in 2004 the civil sector-oriented Heidel group (a manufacturer of machines and machine tools) as well as Nico Feuerwerk GmbH were divested. Also in 2004 Rheinmetall Defence Electronics GmbH, DIEHL Munitionssysteme GmbH and RAFAEL Ltd. signed an agreement to establish EuroSpike GmbH. During 2005 medium-calibre specialist Arges m.b.H. of Schwanenstadt, Austria was acquired, and a 50% stake in AIM Infrarot-Module GmbH (a joint venture with Diehl) was acquired. In 2007 Rheinmetall acquired a 51% percent majority holding in Chempro GmbH, an initial stake in ADS Gesellschaft für aktive Schutzsysteme mbH, and acquired Zaugg Elektronik AG of Switzerland. Acquisitions during 2008 included the takeover of Dutch vehicle maker Stork PWV B.V., and 51% shares in the South African defence contractor Denel Munition (Pty) Ltd. and LDT Laser Display Technology GmbH. In 2010 Rheinmetall AG and MAN Nutzfahrzeuge AG joined forces to found Rheinmetall MAN Military Vehicles GmbH (RMMV), and Rheinmetall AG took over Norway's Simrad Optronics ASA. During 2011 Rheinmetall increased its stake in ADS Gesellschaft für aktive Schutzsysteme mbH to 74%, and its share in Verseidag Ballistic Protection GmbH from 51% to 100%. The company is renamed Rheinmetall Verseidag Ballistic Protection GmbH. In 2012 Rheinmetall and General Dynamics established Defense Munitions International, a 50/50 joint venture for marketing 120mm tank ammunition in the United States. In 2013 Rheinmetall and Ferrostaal GmbH joined forces to found Rheinmetall International Engineering AG, the joint venture planning and constructing turnkey factories, serving as general contractor or subcontractor. In January 2019 Rheinmetall announced that subject to government approavals the company would buy a 55% share of UK-based BAE Systems' land business for £28.6 m. The joint venture (JV) would be called Rheinmetall BAE Systems Land (RBSL) and be headquartered at BAE's existing facility in Telford, Shropshire. If successful, the JV will have a positive effect on the UK’s Mechanised Infantry Vehicle (MIV) procurement, which could result in contracts for at least 500 Boxer vehciles to equip the UK’s future strike brigades. BAE Systems and Rheinmetall are currently competitors in the UK’s Challenger 2 Life Extension Project (LEP), but according to BAE Systems the competition between the companies will continue, an agreement with Rheinmetall ensuring that the solution will be delivered from Telford regardless of the contract winner. These would include the Boxer wheeled armoured fighting vehicle, the Lynx tracked armoured fighting vehicle, the TPz Fuchs and the RMMV HX range of trucks. Boxer is an eight-wheeled multirole armoured vehicle in the >35-tonne class. It is unique in that through swappable mission modules it can be reconfigured to perform a variety of roles. Lynx is a family of tracked armoured vehicles in the 30- to 44-tonne class. The Lynx design concept separates the vehicle into two primary parts, the basic vehicle and specialist mission and role equipment. The Lynx was shown publicly for the first time in June 2016. The TPz (Transportpanzer) Fuchs ("Fox") is a six-wheeled armoured personnel carrier that first entered service in 1979. Current generation models remain in production and Rheinmetall is currently upgrading German Army vehicles to A8 standard. The HX family are a range of purpose-designed tactical military trucks, the first order for which was placed in 2004. The first HX2 range trucks were delivered in 2016. In total approaching 13,500 HX/HX2 range trucks have been ordered since 2004. Other products of interest would include the Survivor R, the AMPV and the TG-MIL range of militarized commercial trucks. The Leopard 2 and M1 Abrams (M1A1 and M1A2) are fitted with Rheinmetall's L44 and L55 120 mm tank gun. The PzH 2000 self-propelled howitzer is armed with Rheinmetall's L52 155 mm main gun. A range of medium caliber cannons from 20 to 35 mm are manufactured, and these include the BK 27, the cannon used with the Skyshield system, and the cannons fitted to the Puma, Marder and Wiesel AWC. Remote control turrets and weapon stations are also offered. Rheinmetall manufactures ammunition for all of these and a variety of other guns/cannons and smaller infantry weapons, including non-company products. The company also has specialist test centres and laboratories, and also has plants for the dismantling and disposal of unserviceable or surplus ammunition. These include a variety of CBRN reconnaissance systems, simulation and training systems, and C4I systems that cover reconnaissance and sensor systems (including thermal imagers), fire control units and TacNet, Rheinmetall’s command and weapon engagement system. Rheinmetall also supplies the Gladius Future Soldier - Extended System and Argus, both modular systems that reduce the burden on the foot soldier while enhancing overall capability. Unmanned ground and air vehicles are also available. Leopard 2A4 of the Singapore Army, which is equipped with the Rheinmetall 120 mm gun. Boxer IFV configured for Australian Land 400 Phase 2 and fitted with Rheinmetall's Lance turret. A Dutch Panzerhaubitze 2000 fires a round in Afghanistan. Rheinmetall KZO at ILA Berlin Air Show 2012. Rheinmetall Canada unveiled the Mission Master UGV at Eurosatory 2018. Legacy products of note of the now Rheinmetall include the QF 15 pounder, a field gun sold to Britain in 1900 and used by the British during World War I. During World War II the company manufactured the 8.8 cm Flak 18/36/37/41Flak and anti-tank gun, the 7.5 cm Kwk 42 (L/70) tank gun used in the Panther tank, and the MK 108, a 30 mm gun used on Luftwaffe aircraft mainly in the interceptor role. The company also designed and built the Karl-Gerät self-propelled siege mortar used by Germany during World War II. A Flak 36 at the Imperial War Museum London. The company designed and built the Karl-Gerät self-propelled siege mortar used during World War II. The 7.5 cm Kwk 42 (L/70) tank gun used in the Panther tank was a Rheinmetall product. Rheinmetall-Borsig MK 108 30mm cannons. Rheinmetall Automotive AG (previously known as Kolbenschmidt Pierburg (KSPG)) is the management company of Rheinmetall AG's automotive technology branch. Rheinmetall Automotive AG was formed by the merging of Pierburg and Kolbenschmidt, these companies found in 1909 and 1910, respectively. Rheinmetall Automotive is a globally operating maker of automotive components and the company plays a leading role in air supply, pollution reduction and pump technology, as well as the development, manufacture and sale of pistons, engine blocks and smooth bearings, including the supply of spare parts. Development of new products takes place in close cooperation with major automakers. The company has been organized into three autonomously operating divisions since May 2012: Hardparts, Mechatronics, and Motor Service. The company's activities fall into seven business units, including Kolbenschmidt (which manufactures pistons); Large Pistons; Pierburg (components for air supply and pollution reduction); Pierburg Pump Technology (coolant, oil, recirculation and vacuum pumps); Plain Bearings (metal bearings and bearing elements as well as continuous casting elements); Aluminium Technology (engine blocks); and Motor Service (repair and maintenance sales for Rheinmetall Automotive). ^ a b c d e f g "Annual Report 2018" (PDF). Rheinmetall. Retrieved 15 March 2019. ^ "Rheinmetall Defence - R&D focus - effectors". www.rheinmetall-defence.com. ^ "Key Figures". Rheinmetall. Retrieved 30 April 2018. ^ a b c d "Rheinmetall Berlin AG". company-histories.com. Retrieved 30 April 2018. ^ a b c "Rheinmetall Group". Rheinmetall AG. Retrieved 30 April 2018. ^ "Rheinmetall Group". Rheinmetall AG. Retrieved 30 April 2018. ^ a b "company's corporate website". ^ "Rheinmetall Defence". Rheinmetall Defence. Retrieved 11 May 2018. ^ "Rheinmetall Defence". Rheinmetall Defence. Retrieved 18 May 2018. ^ "Rheinmetall, BAE Systems launch joint venture for military vehicles". Defense News. Retrieved 25 January 2019. ^ "Rheinmetall, BAE Systems to form UK-based JV". Shephard Media. Retrieved 25 January 2019. ^ "BAE Systems sells control of vehicles arm to Rheinmetall". BBC. Retrieved 25 January 2019. ^ "Large Calibre Weapons and Ammunition". ^ "Medium Calibre Weapons and Ammunition". Wikimedia Commons has media related to Rheinmetall. This page was last edited on 15 March 2019, at 07:33 (UTC).